Trains, planes, or automobiles? We all pick our mode of transportation based on a number of factors: affordability, comfort, and ease. As airport lines get longer, traffic gets thicker, a train is a great option to avoid crowds and get a scenic view, too. If you have some extra money to spare (or win the lottery), there’s also another perk: luxury on rails like you could not believe. Think trains with glass domes for optimal views, carriages with Presidential suites, your own air conditioning, unlimited champagne, goose down bedding, musical performances and more. Rethinking booking that flight yet — and not buying that lotto ticket? Here is a closer look at some of the most over the top train experiences around the world. This private luxury train service travels from London to Venice and other European cities, including Istanbul. The five star stunner features restored historical dining and sleeping cars from the early 1900s. The trip from London to Venice is roughly about 24 hours and costs around $3,100. Grand Suite prices on the Paris-Istanbul route start at a whopping $48,641 per person. They include a double or twin bedroom, a living area where you can request in-room breakfast, and don’t forget champagne and butler service, available 24/7. There are also full private bathrooms and plush robes to take home. “A window to the soul of Africa” is how this 31-hour journey between Pretoria and Cape Town is described. At the departure station, an entourage waits to whisk your bags away. There’s even a red carpet that leads to a private waiting room. After settling into your cabin, a butler greets you and asks your preferences for meals. Save room, because there will be many. The observation car has floor to ceiling windows, and of course, champagne. 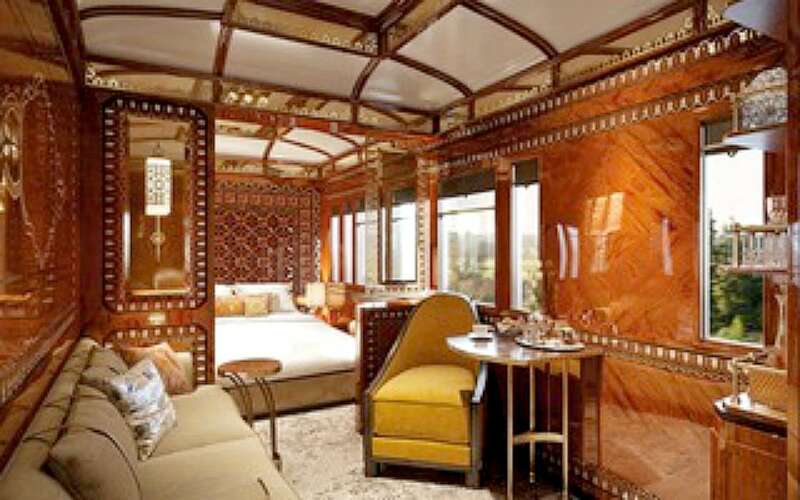 This luxury train features seven carriages that hold up to just 28 people in 14 suites. Space is so limited, there is even a lottery to be able to ride. It is one of Japan’s most luxurious modes of travel and offers stunning views of the island of Kyushu. The route is a 2 or 4-day journey for the senses. Inside the train, the saloon on wheels, “Blue Moon,” offers classic cocktails and seating areas where passengers can enjoy live music. The dining car, Jupiter, serves dishes that reflect each stop on the trip. One of the deluxe suites includes floor-to-ceiling views of the views whirring by outside. Prices start at $5,400 per person. This famous luxury train travels from Vancouver through the Rockies and beyond. The train’s top tier option is its GoldLeaf service, which includes a double-decker carriage with a dining room below and a transparent, domed roof above so that passengers can revel in the beauty of the mountains. Passengers don’t sleep onboard the mountaineer, but the service, views and food is well worth the investment. GoldLeaf prices start at $2,566 per person for five days through Vancouver, Kamloops, Banff, Calgary. Rovos Rail offers a number of journeys throughout South Africa and beyond. Best of all, the trains allow for no more than 72 guests at a time, providing an intimacy and level of service that is unmatched. On the Pretoria to Cape Town route, the train stops in the Cape Winelands. The “Pride of Africa” route includes five luxury train trips a year on a 14-day itinerary from Cape Town to Dar Es Salaam, passing through Botswana, Zimbabwe, Zambia, and Tanzania, and including stops at a game reserve and Victoria Falls. Prices for the trip start at $12,450 per person (double occupancy).